We start with tweeting birdies! 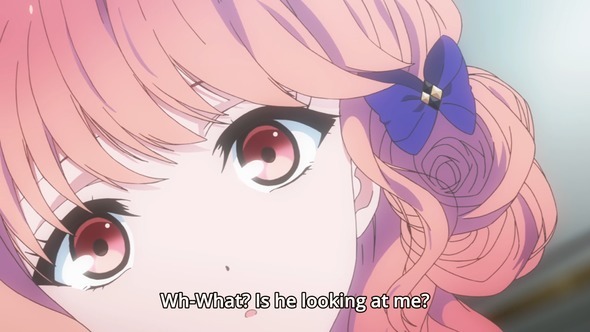 I started watching Bonjour: Koiaji Patisserie expecting to see a story about a girl entering sweets school and meeting handsome boys and making enemies with the other girls, but after the semester opening ceremony the screen went out. Huh? Episode one is only five minutes? They were just getting started! I was getting ready for her to meet the handsome men, and a hazing scene or two, and then I would drop it. The show wastes no time. Well, I did see the enemies, and the boys were introduced, nothing exciting there. The bad boy, the aloof boy, the boyish boy, the suave boy, all routine. The heroine, Sayuri, was as dull as predicted, though her sidekick Ran has possibilities. But for this sort of thing I’ll just stick with my memories of Yumeiro Patisserie, though the target audience is different. In Girlfriend (Beta) or (Kari) we follow Kokomi, a high school second year, as she wakes up, goes to rhythmic gymnastic practice, and gets chatted up by a number of girls, including a French exchange student Chloe, who drops a photo. Seeking to return it, Kokomi goes from classroom to clubroom to library looking for her, a chance for us to get introduced to a lot of other girls, until Chloe runs into her, and that’s it for episode one. 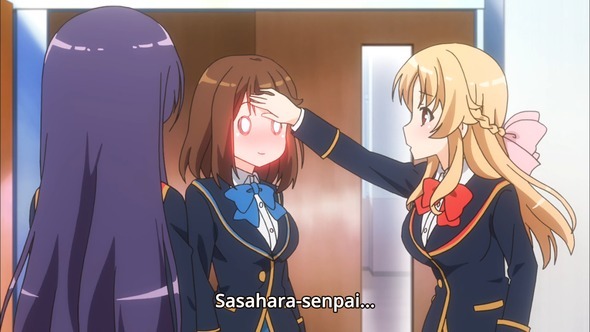 This might work if you take it in the spirit of a healing anime like Aria or Tamayura, because if you don’t it’s incredibly dull. 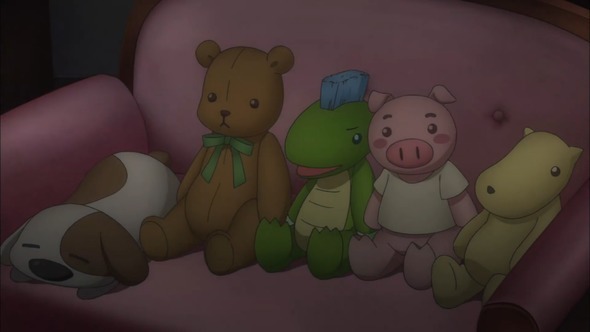 Since the story for the week is finding Chloe, the conversations rarely go past “Have you seen ..?” or “Oh, you’re that girl who’s …” What’s more, the seiyuus must have been told to make their delivery slow and flat; none of them except maybe Yuuki Aoi as the flower-arranging girl has any sort of life to them. The animation and art aren’t much to look at, either. But because there’s a small army of seiyuus working on this series I’m going to keep an eye on it just to see if they’re all going to be misused like the ones in episode one are. I wish Yuuki Yuuna had come first. 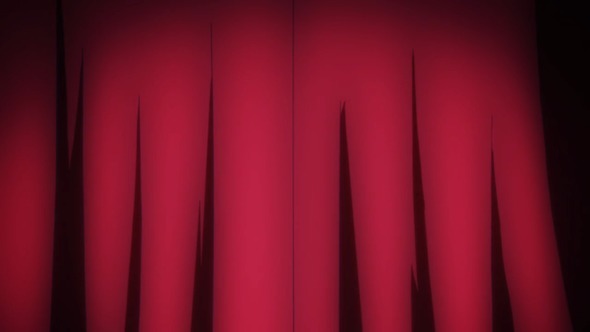 It would have been nice to start this series with a curtain opening. And, phew, finally we have the first episode of Yuuki Yuuna wa Yuusha de Aru, where we follow Yuuki and her three friends, members of their middle school heroes club (like Lagrange’s), going around helping whatever club or person needs it. They cutely do (and nearly botch) an elementary school puppet play, and next they’re going to find owners for kittens! 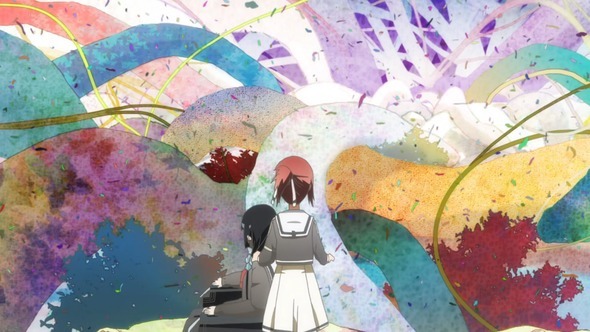 The club prez, Fu, is a glutton, Togo’s in a wheelchair, Itsuki is devoted to her sister, all cute quirks, well, not the wheelchair, but since we rarely see physically disabled characters in anime, she becomes interesting just for that fact. So I was watching this, weighing the cuteness level, waiting for the kittens, when weirdness strikes. Fu’s been hiding something from them. They’ve been chosen as defenders of Earth, or warriors for Shinju-Sama, maybe both. The strange world they’re thrown into is colorful, rich, and pretty, a forest I’d like to walk around in. But there’s a evil thing there and they must defeat it. Fu, maybe you should have told the girls sooner that they’d be transformed into magical girls and doing life-or-death battles! While we watch the transformations and the awkward bouncing around as they get used to flying (well, Itsuki), we also get Fu’s clumsy infodump about what’s going on, while she’s battling, of course. And we watch Yuuki gather herself together and show her mettle … but we’re out of time. 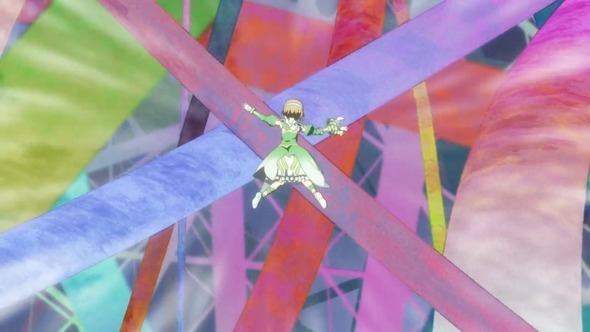 Okay, it’s most likely a routine magical girl show but with extraordinary art and animation lifting it up. The Itsuki trying to fly sequence is maybe the most striking visual bit of the new season so far. The world is all colorful branches and leaves and flying petals, and the characters leaping through it all is dazzling to look at. Whether this is enough to overcome the probably mundane story can’t be determined yet, but it’s interesting that Togo, in her wheelchair, did not try to transform because she felt she could do nothing. There’s a story angle you don’t normally see. This one is definitely worth keeping an eye one. And that’s it. 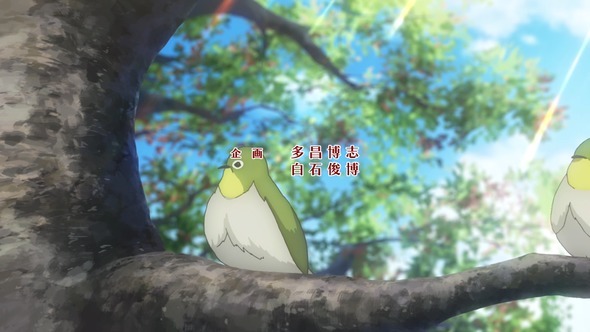 The only show remaining for me is Mushishi, but I don’t need to tell you to watch it. Now to decide what to keep or dump and what to write about.